Fragmented pottery unearthed in a rockshelter in east central Colorado has revealed traces of salicylic acid, a substance derived from willow bark that’s the natural precursor to modern-day aspirin. Dated to the 7th century, the pottery may be the earliest known physical evidence of the chemical’s use in North America, according to archaeologists. Denise Regan, who begins her graduate work in archaeochemistry at Durham University next year, took part in the dig that uncovered the fragments in 2011, at a remote rock overhang in Elbert County, not far from where the Great Plains meet the mountains of Colorado’s Front Range. There, she and her colleagues uncovered artifacts going back more than 1,300 years, including pieces of a small scraper or knife, and four pottery sherds as much as 80 centimeters below the surface. 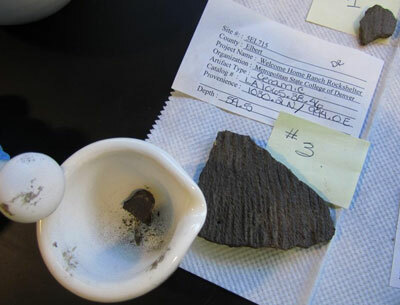 To learn what the plain gray pottery might have been used for, Regan called on her training in biomolecular analysis to search for residues on the fragments. The ethnographic record is rich with accounts of native peoples throughout the West using the bark, leaves, and roots of willow trees as a topical painkiller and to reduce inflammation. Particularly among Puebloan cultures and groups of the Great Plains, people were known to prepare infusions of the willow’s roots and inner bark, and make poultices that were applied to aches, some practices that continue today. “If you talk to the Arapahoe or the Cheyenne, they’ll use willow bark either as a tea with the leaves or they will soften the bark in boiling water and chew on it for toothaches and as a pain reliever,” Regan said. But salicylic acid can be dangerous if taken internally in anything but small amounts. So in the late 19th century, European chemists devised a safer derivative — acetylsalicylic acid, marketed as Aspirin. The cultural origins of the pottery remain unclear, Regan said. Radiocarbon measurements of the sherd dated it to between 586 and 692 CE. But with so few fragments, made with no distinctive markings, it’s difficult to source the pottery to a specific culture, she said. Aside from the one sherd’s definitive traces of willow bark, she added, the most notable thing about it was simply that no other substances were found on it. “We didn’t find evidence of anything else organic,” she said. “Normally we’d find some sort other type of a lipid that could be traced back to maybe a rabbit or some sort of meat, or something else that they probably would’ve eaten. This suggests that the sherd may have been part of a “medicine pot,” a specialized vessel that was only used to prepare or carry therapeutic preparations, she said. In addition to providing physical proof of ancient medicinal practices already known from the ethnographic record, Regan added, the pottery’s discovery adds more than a thousand years to our understanding of native lifeways in this sliver of the ancient West. “I think the implication is that there is continuity — that we know that willow bark is in use now, and has been historically, and now we find that it was also used prehistorically. 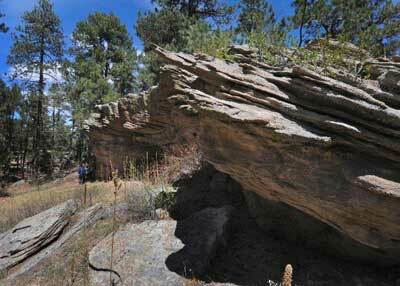 Still, the find also serves as a reminder of how much we have yet to learn about life in 7th century Colorado. Chemical analysis like that used to study the rockshelter sherds may be an important tool in opening up this chapter of the past, Regan said. “We’re just at the beginning of this,” she said. Very interesting article. Just one note: I have no idea how much 80 centimeters is. If one’s publishing an article for consumption in the U.S., it’s rather obtuse to use metric measurements alone. I suppose some think that makes it sound all scientific, but the fact is, it isn’t the common system here and any benefit to it disappeared with the advent of the pocket calculator. Very interesting article and research. This is especially important too in showing how persistence and digging deeper into the evidence can reveal interesting and new findings.